17 May 2014, Leiden, the Netherlands. 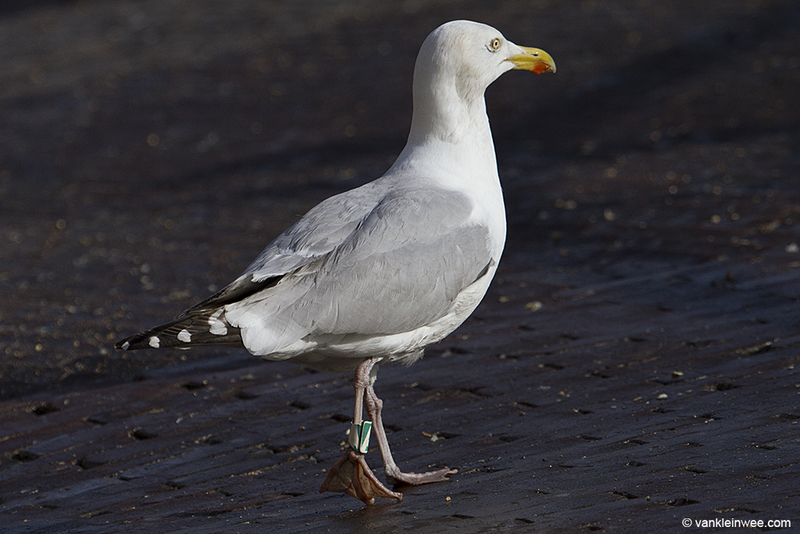 European Herring Gull ringed as (Black D)/Green A. Last year I decided to compare the primary pattern of each moult cycle of this gull of the years in which I observed him to see if any differences could be detected. It turned out that there were indeed differences, albeit minor ones (see Primary pattern variation in individual European Herring Gull). This year I have been able to take additional photos and compare the current primary pattern to that of previous years. The most noticeable change is once more to do with the size and position of the small mirrors on P9. There is no black mark on the outer web of P5 in the right wing. * The calendar years actually represent the moult cycle that was completed at the end of the previous calendar year; I’ve decided to refer to calendar years instead of moult cycles (in the 29th calendar year the 28th moult cycle was scored) for readability reasons.